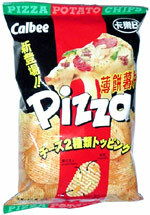 Taste test: These chips are covered very heavily with pizza flavoring powder. Some of them have spots of melted cheese on them — and it really looks like melted cheese. The melted cheese isn't the most pleasant site, but the ones with cheese really taste very cheesy. In fact, they really do taste like pizza. The ripples help to give them a more flavorful crunch. Quite a tasty treat. Smell test: Smells like a pizza, very cheesy, not that tomatoey. From the package: The front of the bag has a diagram of one of these chips, showing the various ingredients on the chip and what color/shape each is: gouda cheese, vegetable, cheddar cheese and bacon. 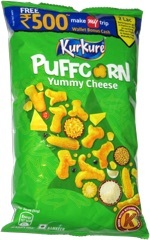 This snack was discovered by Jeremy at Uni on Avenue St. Laurent in Montreal's Chinatown.